Most (67%) continue to say defending the country from future terrorist attacks is a top priority, though this is one of the lowest shares citing the issue since the Sept. 11 terrorist attacks and far lower than the roughly eight-in-ten who called it a top priority through much of the early to mid-2000s. One issue that’s not a major concern for the public: taking steps to reduce the budget deficit. Just 48% say reducing the deficit should be a top priority for the president and Congress this year. Concern over the budget deficit is much less widespread than it was during Barack Obama’s administration. In 2013, 72% of the public – including 81% of Republicans and 65% of Democrats – said reducing the deficit should be a top priority. The Pew Research Center survey, conducted Jan. 9-14 among 1,505 adults, finds that Republicans and Democrats continue to stake out markedly different priorities for the country. Partisans are even further apart when it comes to defending the country from future terrorist attacks: A large majority of Republicans (83%) calls this a top priority for the country, compared with a about half of Democrats (53%). And while most Republicans place top priority on strengthening the military (65%) and dealing with immigration (68%), fewer than half of Democrats say the same. 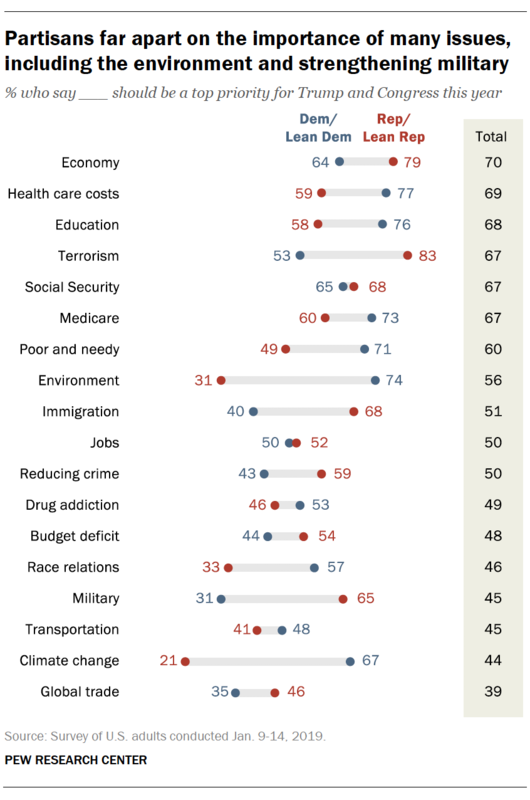 By contrast, a majority of Democrats (71%) place the highest priority on dealing with the problems of poor and needy people, compared with 49% of Republicans. When it comes to the environment, Democrats are 43 percentage points more likely than Republicans to say protecting the environment should be a top priority (74% vs. 31%) and 46 points more likely to call global climate change a top priority (67% vs. 21%). Taking steps to make the Social Security system financially sound is one of the only issues where comparable majorities of Republicans (68%) and Democrats (65%) say this should be a top priority for the country. As the public stakes out its agenda for the president and Congress, Americans increasingly see a big difference in what the two parties stand for. 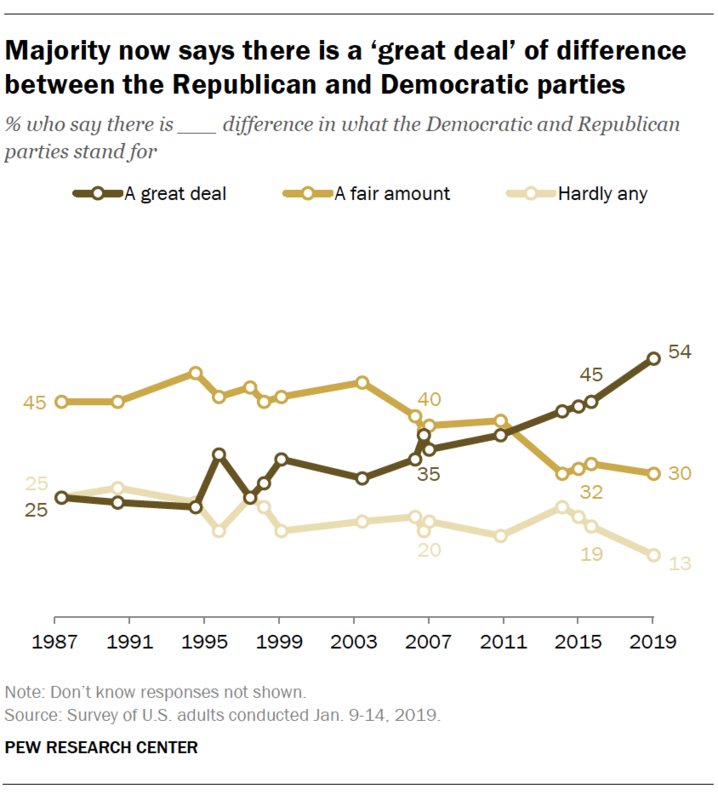 For the first time since the question was first asked more than two decades ago, more than half (54%) now say there is a great deal of difference in what the Democratic and Republican parties stand for, compared with smaller shares who say there is a fair amount of difference (30%) or hardly any (13%). The share that sees a great deal of difference between the two parties is up from 45% who said this in 2015 and from just 35% who said this in 2007. While the public expects greater discord between two parties they view as far apart, rank-and-file Republicans and Democrats see their own parties as united. Overall, 55% of Republicans and Republican leaners describe the GOP as mostly united on issues and its vision for the future. 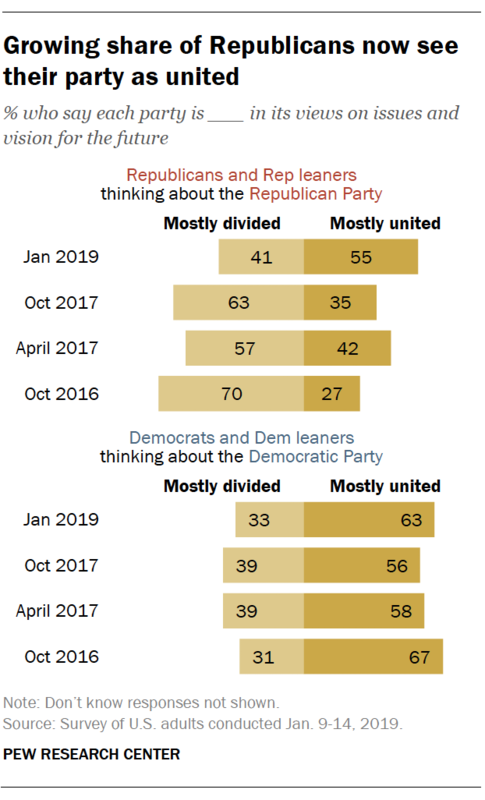 This marks a major shift from October of 2017, when most Republicans (63%) said their party was divided. Among Democrats and Democratic leaners, 63% describe the Democratic Party as united in its views on issues and vision for the future; in the fall of 2017, 56% said this. Strengthening the economy continues to rank as a top issue for 70% of the public overall – including nearly eight-in-ten Republicans (79%) and 64% of Democrats. While little changed from last year, both parties are now considerably less likely to cite the economy as a top priority than they were in the years following the Great Recession. In 2013, 87% of both Republicans and Democrats said improving the economy should be a top priority. Over the past year, the importance of improving the job situation has declined among both Republicans and Democrats. A year ago, 66% of Republicans and Republican leaners said improving the job situation was a top priority for Congress and the president. Today, roughly half say this (52%) – a 14 percentage point drop. There has been a more modest decline in the share of Democrats citing jobs as a top priority: 50% now say this, down from 58% a year ago. Today, 83% of Republicans and Republican leaners say defending the country from future terrorist attacks should be a top priority for the president and Congress this year. By contrast, only about half of Democrats (53%) say the same. 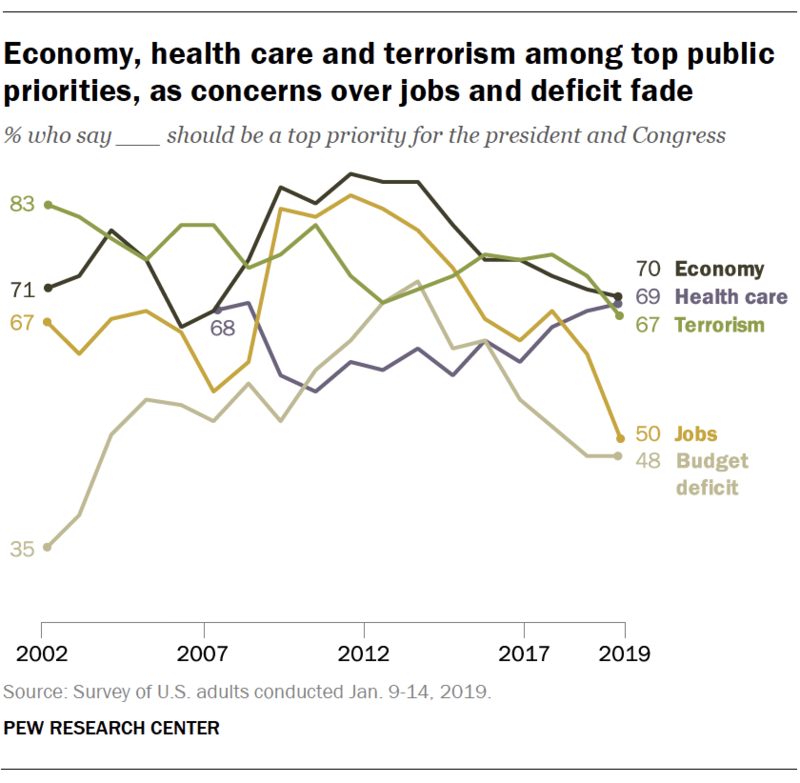 The share of Republicans giving top priority to defending the country from terror attacks has not changed much in recent years, but the share of Democrats saying this has declined significantly. In 2017, for instance, about seven-in-ten Democrats (72%) viewed defending the country from future terrorist attacks as a top priority for the president and Congress. 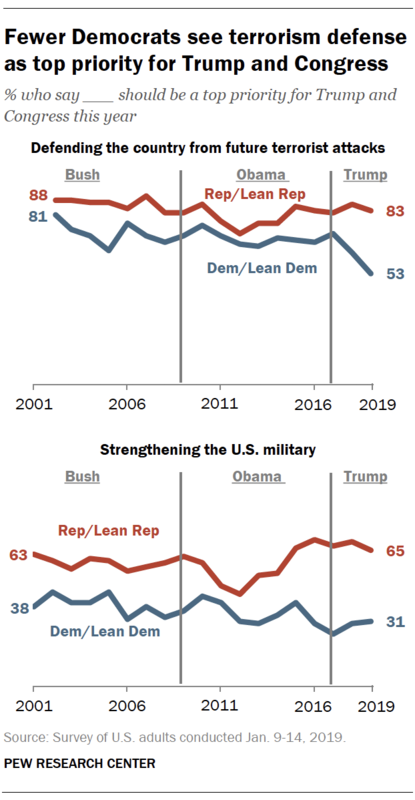 As has been the case for the last several years, Republicans are much more likely than Democrats to say strengthening the U.S. military should be a top priority: 65% of Republicans say this, compared with 31% of Democrats. The public’s priorities have shifted over time and many issues are viewed differently today than they were at different moments over the past decade. as a top priority has fallen 34 percentage points since 2011 – and 12 points since last year alone. Strengthening the nation’s economy and reducing the budget deficit have also declined in the last eight years, although less sharply. The share saying global climate change should be prioritized has increased substantially since 2011; then, just 26% of Americans said it should be a top priority for the president and Congress. Today, 44% say it should be a top priority. Other issues that are given greater priority today than in 2011 include reducing health care costs, dealing with the problems of poor and needy people, protecting the environment and improving transportation infrastructure. The public takes a deeply pessimistic view of the prospects for partisan cooperation in the coming year. 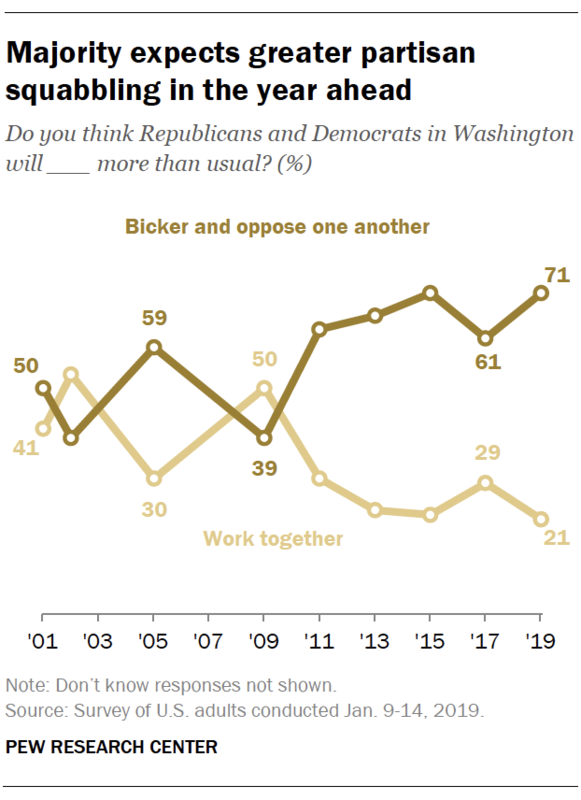 About seven-in-ten (71%) say they think Republicans and Democrats in Washington will bicker and oppose one another more than usual this year; far fewer (21%) think they will work together to solve problems more than usual. The share that expects greater partisan opposition in Washington is 10 points higher than it was in January 2017, following Donald Trump’s presidential victory. It matches a high of 71% from January 2015, following the 2014 midterm elections. Nearly eight-in-ten Republicans and Republican leaners (78%) expect partisans in Washington to bicker and oppose one another more than usual this year. A slightly smaller majority of Democrats and Democratic leaners (67%) also take this view. Looking ahead, most Republicans want to see their party move in a more conservative direction. 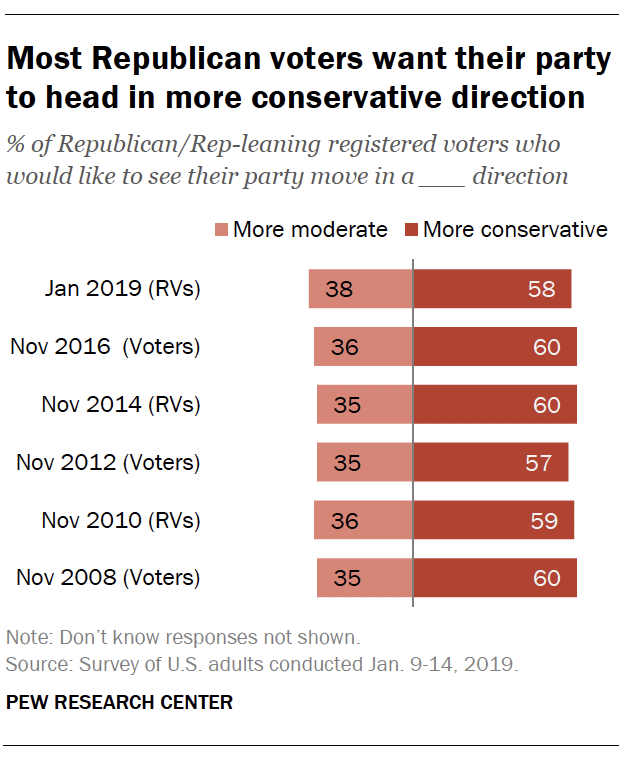 Nearly six-in-ten Republican and Republican-leaning registered voters (58%) say they want the GOP to move in a more conservative direction, compared with 38% who want it to move in a more moderate direction. Republican views on their preferred ideological direction for the party are about the same as they have been following other recent midterm and presidential elections. Among Democratic and Democratic-leaning registered voters, somewhat more say they want the Democratic Party to move in a more moderate (53%) than more liberal (40%) direction. These views are about the same as they were following the 2014 midterm elections. 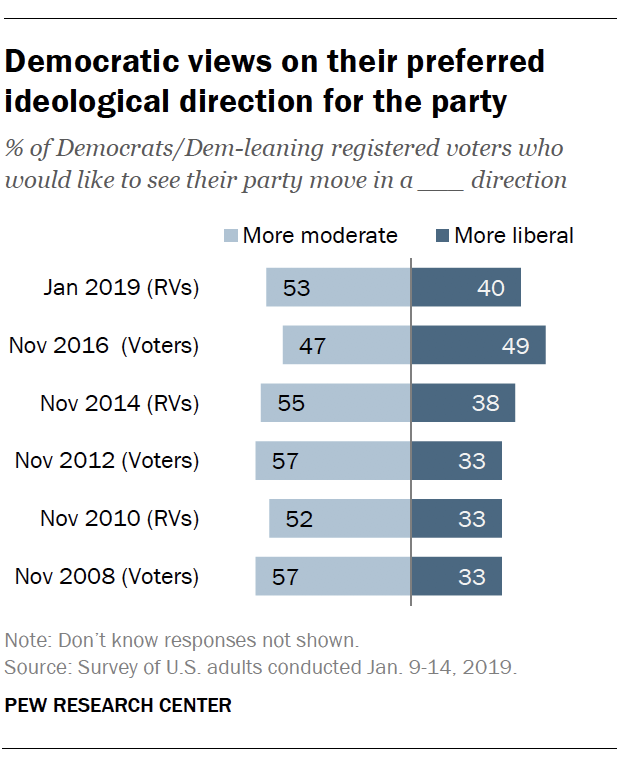 In November 2016, after Trump’s presidential election victory, a somewhat greater share of Democrats (49%) wanted the party to head in a more liberal direction. 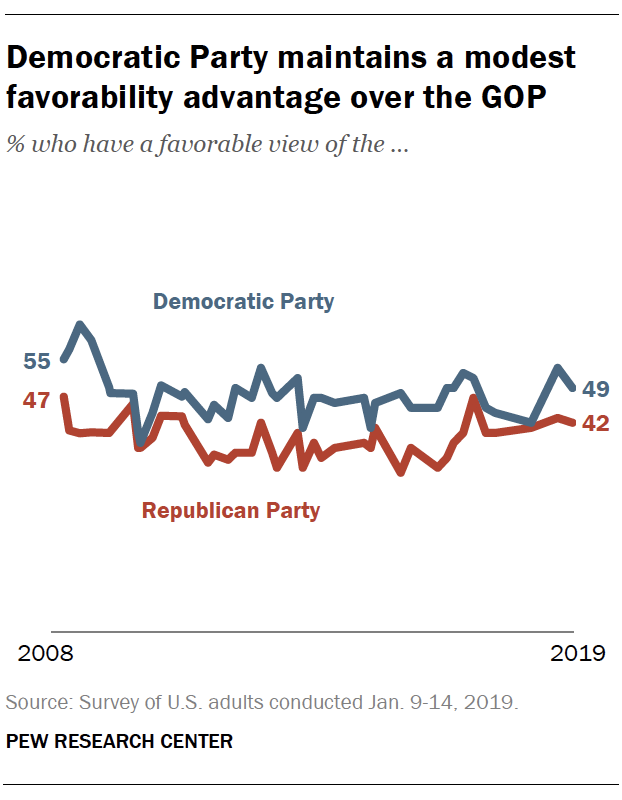 The Democratic Party continues to receive slightly higher favorability ratings than the Republican Party – though neither party is rated favorably by more than half of the public. Overall, 49% have a favorable view of the Democratic Party, compared with about as many (47%) who hold an unfavorable view. Ratings of the Democratic Party have ticked down from September of last year (53%) but are comparable to where they have been at other points in the recent past. Views of the Republican Party tilt negative, on balance: 54% hold an unfavorable view of the GOP, while 42% view the party favorably. Ratings of the Republican Party have changed little in recent years.